Winner has been notified via email! Vicki Smith!!! Hello, and welcome to the Essentials by Ellen Holiday 2015 Release Hop! I’ve been waiting for this day for a long time!!! The reveal and release of the Ellen Hutson Holiday release designed by my dear friend, Julie Ebersole! is here! I’ll be showcasing several of the new stamp sets and dies on my post today! We’ve got a lot of talented designers on this hop so be sure to hop along because there are giveaways! Yup, giveaways!!!!!! More info on that at the end of this post! There is also a Grand Giveaway in the CLASSroom! To enter, be sure to leave a comment there as well as every hop along the way by August 11th, 2015!!! Winners will be announced by the weekend! The next person on the hop is Heather Campbell! For the hop today, I’ve created four cards in total and TWO videos. I made more but the rest will be posted over the next week or two because I didn’t want to overwhelm you with a card heavy post when you have so many other marvelous hoppers to get to! All supplies I used along with all the new stamps and dies from this release are linked at the end of this post! First up, a few cards from the Got Candy stamp set and coordinating die!!! I think this set is just so stinkin’ fun! I will start with the more toned down version…. I added very little Color Burst/water and kept it simple by stamping in the Happy Halloween sentiment and bat in Versamark, and heat set with Liquid Platinum embossing powder. I love how unpredictable the Color Bursts are and the solid bat image from the stamp set is adorbs! Ok, next up is something a little out there! Like cra cra…. I decided to make a VERY VIBRANT background with the Ken Oliver Color Bursts and Perfect Pearls mix. Then I stamped the adorable ghosts onto white card stock and die cut the ghosts with the coordinating die and popped them up with some foam dimension. I stamped the Happy Halloween sentiment multiple times in Versamark and heat set with the Liquid Platinum embossing powder again. As a finishing touch, I stamped a few black stars from the set, flicked on some white dropplets and…. Well, you’ll see……. This one is so “out there” from my norm, I hesitated even blogging it… LOL! And now, let’s move on to my next project! From Halloween to Christmas. I’m using the Mistletoe and Holly stamp set and coordinating dies for for this card. I stamped the flowers in versamark and heat set with white embossing powder and then watercolored them with the Zig Clean Color Real Brush markers. I went with an untraditional color palette and threw in some purple (Distress Inks: Cracked Pistachio, Worn Lipstick and Seedless Preserves). The sentiment was stamped with Versamark and heat set in, why yes… Liquid Platinum embossing powder!! And a finishing touch, some Gold Texture spray and white paint flicks. And last, if you are still here with me, I have a card and video using the same Mistletoe and Holly stamp set showcasing some easy masking and coloring techniques. I’ve got a video up for this one!!!!!! You can watch it by clicking HERE! I also have have super quick FULL REVEAL video below to share with you! You can see all the products in this release up close and personal in this short video. Here is the complete list of hoppers! Remember, leave a comment on each of their blogs because every one of the hoppers have a giveaway! Laurel Beard – YOU ARE HERE!!!! GIVEAWAY TIME: I am giving away this set to one lucky commenter. Please ensure you leave your email along with your comments or you have the “no reply” option disabled. You have 48 hours to respond or another winner will be chosen. You have until August 11th to comment for a chance to win! LOVE these techniques!!!! FAB, so tickled to be in this line up of all star designers! Beautiful cards and I loved the video. Could you please link to the full back sticky note you showed in the video? There are so many options on target.com and I can’t figure out what is full back and what is regular. Thank you! Love the look of the new stamps and dies!!! I love this stamp set awe who am I kidding I love it all! Fabulous samples with these fantastic stamp sets! Laurel, as always, your cards, your video and especially, your enthusiasm really deliver! Amazing showcases of the new release! The poinsettias…oh my! Heart captured! Oh No! You have melted my shopping freeze! LOVE! Great job! Love your cards and all the fabulous new release products! Purple pinecones and candy stripes, love it! With each card I kept saying, “this one is my favorite!”, then I’d see the next one and fall in love all over again. . . Lol! Thank you for doing the videos (and the future ones) because I really enjoy watching you create and learning from you. You did this release proud lady! Thanks for the inspiration. Great techniques. I have got to get some of those Color Bursts! They make such amazing backgrounds. Great cards and techniques!!! Thank you so much for sharing and for the videos! and fantastic! Can’t wait to see more. The Mistletoe and Holly set has caught my eye!. Your cards and videos are great. Awesome release! Always look forward to your videos as they are fun. Thanks for the videos! Great release. I also love the backgrounds you did for the cards. Thanks for the give away Laurel – you’ve done a great job with your examples today. I really like the Be Merry Poinsettia card. I love all the new stamp sets! Your cards are very nice! Thanks for the chance to win this set! Love it! Your mistletoe and holly card just sparked my holiday spirit. Now I want to get going on my cards! Love this new release and all the cards you made! Thanks for showing a sample for each new set. The colored pencil on the white embossed card is a neat technique and I love to use it and see it used. These are all beautiful, Laurel! Love your vibrant watercolor backgrounds on the first two! 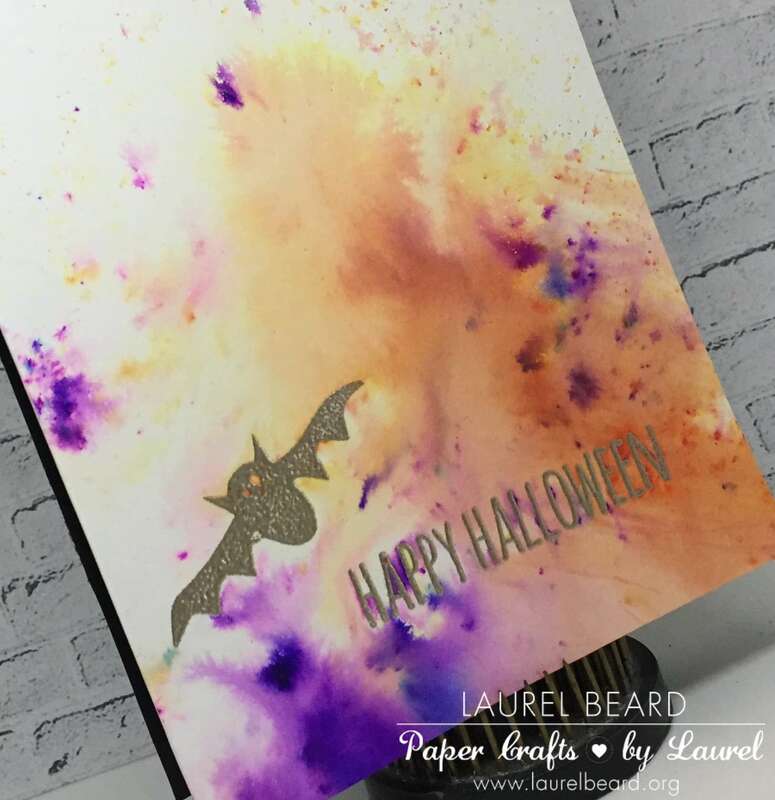 Pretty cards – especially the Halloween ones! Fabulous release! Love your cards. You just inspired me to start thinking about the holidays. Great Release. Love the cool backgrounds you created for the Halloween cards, and the poinsettias are simply gorgeous!! Oh my! I was on the fence about the poinsettia but the kraft card has convinced me. What a tremendous release. Fabulous cards! I’m anxious to get my hands on the Color Bursts and these new stamps and dies! Love the fun Halloween designs, and the Mistletoe and Holly set is fabulous…. didn’t think I ‘needed’ another holiday set, but I gotta get it! Your color burst techniques for halloween are wonderful – describe the spooky day so well! Great cards! Color bursts are perfect for those halloween cards, and it’s good to do something different from your “norm”! Great cards! Love the color burst — just took a class with Ken Oliver himself this weekend! Love the Christmas card. You are right – that striped paper sets it all off! Awesome cards! Love the backgrounds and beautiful coloring! Too cute. Love your ideas. Love these.. I think you’re ghost one is spectacular!!! You are so talented. I’ve been watching you on YouTube for a while now and everything you create is fabulous. These Halloween and Christmas cards are nothing short of awesome! Oh! that color burst background is beautiful! Beautiful card samples I love the really dark one with the ghosts! LOVELOVELOVE all of your cards!!! Especially the ones using the Mistletoe and holly stamps!! WOW! WOW ! WOW!! Absolutely gorgeous!!! TFS! I love your “out there” card! It’s my favorite! Look at you , getting a jump on Halloween and Christmas. Love these new images, which you’ve used so well on these wonderful cards. Love the Halloween and Christmas stamps! Great techniques, Laurel and great new release! Laurel your cards are just gorgeous. Love the backgrounds you created on the Halloween cards, so cool. Way to go bold with the second halloween card! It is amazing the different effects you created from the color burst. I think I need to play with some of that. Love the purple on the non-traditional pointsettia/mistletoe & holly card too. Boy, you’ve been busy with this release. So many cards, videos and hints. Thanks Laurel. Oh no! Love them all! Love that Poinsettia and coordinating die soooo much! Beautiful cards and I love the use of the Color Burst for the Halloween cards..I just purchased some and loved seeing it in use!! Wonderful cards!! I especially love your ghost card, the background is incredible!! Love all your cards! The Halloween backgrounds are incredible. I love the wild background on your ghost card. Great release video, too. Gorgeous cards!! Great holiday release from EH. Thank you for the wonderful instructional video and inspiration. Such a pretty card. Love the use of the kraft cardstock and the striped border. Awesome cards! I love the effect you got with the color burst on the first card! It looks amazing!! Your poinsettia cards are so pretty! Gorgeous colors and LOVE how you framed them on the first card, really makes a beautiful card! You have really gotten my creative juices flowing. Love everything – especially your Halloween card with the color bursts ! Loved your cards and enjoyed the video! Thanks for sharing. LOVE what you’ve done with the new release! Great cards! Especially love the Mistletoe and Holly card in your video! I am going to have to pull out the pencil crayons and Kraft cardstock…love this! Great card ideas. Very nice! Love the Halloween color burst background!! Great cards – lots of inspiration!! 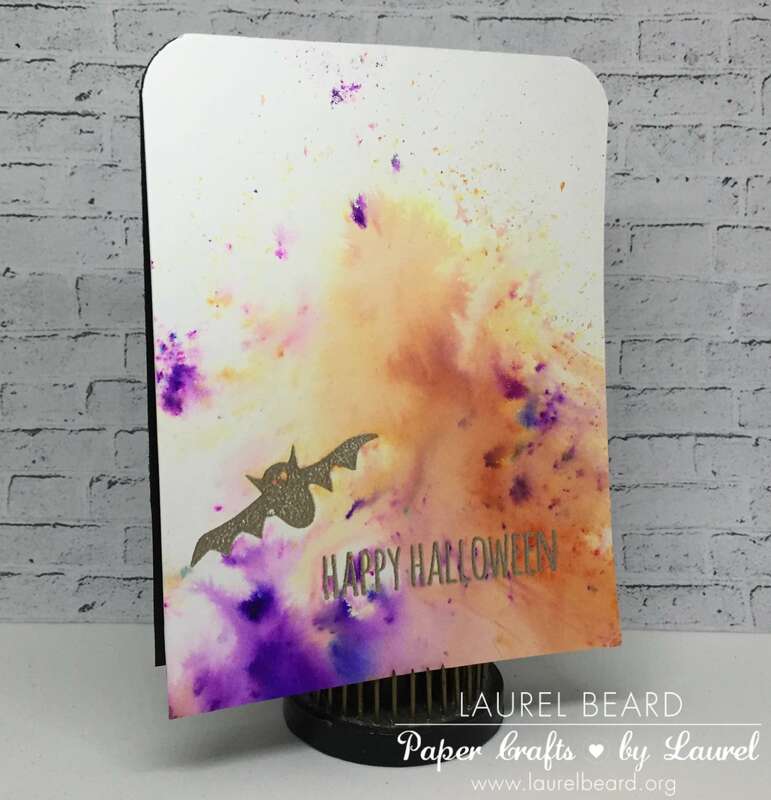 Awesomely cool backgrounds on your Halloween cards and the white embossing on your holiday cards just makes them look so stupendous!!! Love these cards and you have done an incredible job showcasing these sets!!! Love ALL the cards! Such cuteness. I agree with you on how great white embossing and colored pencils look on that kraft color card stock. Great video! Thanks for the chance to win a prize! Love Halloween and your cards are fabulous; the color combination is so great. Glad you posted something outside your comfort zone, it is great. Thanks for sharing the videos. Great backgrounds on your Halloween cards!!! So many lovely cards … the new release is looking super! What stunning creations!! I love your backgrounds on the Halloween cards. They are amazing. The way you created the Christmas cards is just beautiful. Stunning design! Your Halloween cards are so stinkin’ cute! Wow… beautiful poinsettia cards…love the techniques! What a fabulous release! Thanks for the great inspiration. Your cards are beautiful. WOW! Love your color burst card! Great cards-love the look of the color bursts. If I have any $$ left after Ellen’s release, I will have to check them out too! LoVe how you did the cards, especially the Halloween! Beautiful Christmas cards! Love the Mistletoe & Holly set. Cute Halloween cards also. Thanks for both videos. Looking forward to seeing your other cards. Love the stamps and dies all are cute! I love the color burst backgrounds. This is a new product to me. I will have to look into it. Love your cards and as always love your video. Gorgeous cards! The background you created with “Color Burst and Perfect Pearls” is to die for! Just stunning! Wow…. just beautiful! Amazing color/detail! What an amazing selection of cards! Love your second Halloween card, it is so out there and wild, perfect for Halloween! Your Christmas cards are just beautiful too! The white embossing on the craft paper (Brown) was my favorite by far. Would never have thought of using that color, especially for a Christmas card. Beautiful! Beautiful non traditional colors on the Christmas card. And the gold splatter is just a wonderful touch. Thank you! Super cute cards Laurel. Love the techniques you gave us too. Aren’t Julie’s designs the greatest? Love your cards! Great new release! What great cards! Love the colors and themes! So fun! Lovely collection of cards. Love that last one with the candy stripe edge — great touch! Yep love stripe paper any time of year. Pretty card. So many beautiful creations. Love those color bursts. Beautiful cards!! Those ghosts are to cute!! I love the video. Coordinating dies are sure nice. I like all o f your work. Thanks! Wow! How cool that you shared so many cards with us…thank you! Your cards are beautiful! Love to style! LOVE all the cards and the new sets!!! What a wonderful assortment of cards! Love your cards. I especially was intrigued by the flicking on the back of the card to flatten those perfect pearl peaks! Love all of these! The color combos on the first christmas card is my favorite! Thank you for sharing! Beautiful cards!! Love the Kraft one!! Lovely..
Color burst is right. Awesome job! What a great bunch of cards featuring Julie’s new stamp images. I particularly like the first Halloween one, which I mentally labelled Fire Mountain as soon as I saw it. Wow all your cards are so beautiful! Especially love the color scheme of the last one! Thanks so much for sharing your great ideas and creativity! Wonderful video! So quick and cute with the pumpkins! Thanks for the whole release video too- it really helps to see them all in one setting! Wow! Great video on the card and I watched a couple of others, too! Thank you for the chance to win. I just love the stamp sets. Hi! I watch all of your videos, so entertaining and educational! I would love to win this stamp set. Thanks for sharing all of your cards. Such lovely creations and fabulous techniques! Thanks for sharing! I can’t wait to play with my Ken Oliver Colorbursts! They are unpredictable and so random! Diggin’ your poinsettias. Nice video too. Such cute Halloween cards, and really like the non-traditional Christmas colours!! I loved all the Christmas cards! great cards…thx for the video too. I loved all your cards. Lovely. Just love the thought of holiday cards! I love your fall cards! It’s Halloween, so out there is perfectly acceptable! 🙂 Your purple and green Christmas card is just downright stunning! Just love this non-traditional color combo! Thank you for the chance to win too! With every hop on these blogs, the Got Candy set speaks to my heart more and more, and with those Ken Oliver color bursts.. how could they not just scream Halloween even more? Amazing! Thank you for sharing! So many gorgeous cards! I love seeing the new fall and winter release! Great cards! It’s hard to pick a favorite. Hadn’t seen the Ken Oliver color bursts before but I will definitely be checking them out. They make such great backgrounds for Halloween cards. Great cards and great video. Thanks for sharing! The funky, fun backgrounds on the Halloween cards are so great. And I really like the untraditional colors on the Christmas card! Lovely examples for the new release! Thank you! Wow, those Colorbursts are awesome on your adorable Halloween cards! I love your watercoloring and un-Christmas colors on your beautifully watercolored poinsettia! Lovely cards! Enjoyed this stop. Ooh so spooky! Love your techniques. The poinsettia cards are lovely. Great cards. I particularly like the Be Merry card. Oh your Halloween cards are so fun!!! And those poinsettia cards are very very pretty!!! I love your cards and your videos. Thanks!! Love the cards, love all the dies to coordinate! Your Christmas cards are just lovely! Halloween is just plain fun! Oh my goodness! You have been a really busy girl! All of your projects are amazing! Love your Halloween and Christmas cards! Love the prismacolor flower card. I thought I was the only person that thought masking was time consuming! Fun and colorful cards!! Love the purple ghosts. What a fantastic array of cards. Gorgeous cards! I especially love the the background on that first one. Cosmically delish! Great release and fun cards. 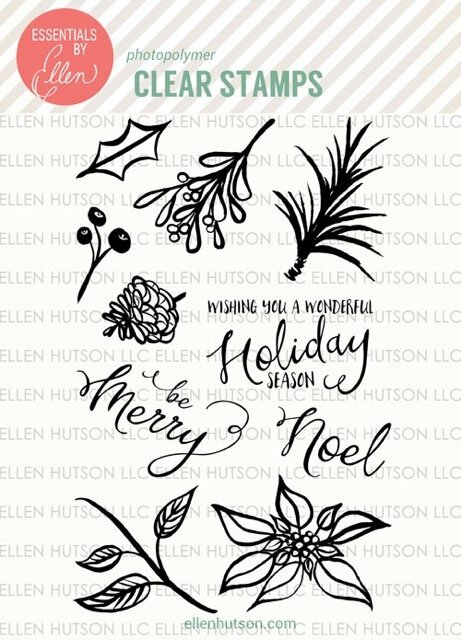 The mistletoe and holly stamp set is adorable…love your examples! Great cards! I love the colors you used. Thanks for sharing! Oooo, love how the bats seem to come from a scary background. Neat techniques! Wonderful new products and great cards for inspiration. Can’t wait to get some of these. …or all of them. ..hehehe! Great cards. This is a great release. Beautiful cards. Can’t wait to get a few of these goodies for the best times of the year! Thanks. Laurel, all of your cards are wonderful. I don’t do many Halloween ones, but I do love the techniques you used. I just ordered some color bursts and can’t wait to give them a try. I love the Christmas cards, very creative use of the colors. Thanks for sharing and the chance to win. Love your card, looking forward to release. good grief woman…you are a-mazing! seriously love each and everyone of your beautiful cards…WOW. Hope you were able to land a new techie toy today! Beautiful cards. I’ve just started experimenting with the colour bursts so it’s nice to see some examples. Beautiful & unexpected. Love your unique take, Laurel. Gorgeous cards, Laurel! Thanks so much for your wonderful videos, too! Love your cards, Laurel! Thanks for the video. I am in love with this new release. What a lovely Christmas card I would be honoured to find that in my mailbox this year. Cool backgrounds! Glad this blog hop helped me find you. The card video was great. I will need to try colored pencils on Kraft. Love your cards! I can’t wait to see the other videos you prepared!! Love the simplicity of the Halloween cards!! Wow! You. We’re really busy! Lovely cards! Really enjoy your videos and the cards you make. Fabulous cards! Love the kraft one, so vibrant and pretty. Your backgrounds are so fun! Thanks for sharing! These are simply amazing…just love your style! I love the color bursts great techniques . Perfect colors on the Halloween cards! Love the pointsettia too! Really fun styles of cards! TFS! Love the techniques and the cards. Love your crazy backgrounds. So very fun. Love how easy these will be to add color! Loved both Christmas holiday cards! Holiday season card is THE ONE! So beautiful! Especially the Mistletoe and Holly cards! Wonderful cards! Loving those color bursts and the coloring on kraft! Fall is my favorite season and I’m always looking for great fall images. Really love these! Love the Christmas card with the distress ink frames…so pretty. Love the mistletoe and holly on the kraft cardstock! Love your design and colors! Ahhh, it can’t be time to start thinking about fall and winter yet!? This fabulous new release MIGHT make me dread it a little less, but I’m still going to soak up summer while it’s here! Love the cards! Great job! I really like your colors, different and effective. Great job on your cards, Laurel. Both poinsettia cards are very pretty, but those halloween cards are too cute. I love the dark and spooky background on that ghost card. I love that you’re not afraid of color! Me either, the more color, the better I like it. I love your non traditional color Christmas card because those are the colors I decorate with, they are my traditional colors! Great new release – and a fun blog hop. So full of inspiration. The pinecones are calling me. Thanks for sharing the super techniques for some super stamp sets! The mondo poinsettia is awesome. This release is really nice. Can’t wait to buy the Halloween set! These would be so much fun to create with. I love the “be merry”. And your ghost cards are so cool. Love your ideas with these awesome sets! The colors are outstanding! Very creative. All look great. I like you choice of colors. thanks for sharing your great cards Laurel. Love this new release. The ghosts tickle me!!! Cute, cute, cute card. Love the mistletoe & holly set… Those Colorado burst backgrounds are gorgeous. love love love halloween cards!! Great cards love the bat card thanks for sharing your talent. Great cards to showcase a fabulous release! I just picked up some Colorburst so I am looking forward to playing…thanks for the inspiration! The use of frames and watercolour is gorgeous! Beautiful cards. Love the color burst background on the first card. I would also like to win a little Ellen/Julie live. Love the way you show-cased the stamps and dies with stunning backgrounds! I love the candy cane paper accent on the poinsettia card. Beautiful! Fabulous cards! I love them all! So many lovely cards! Great backgrounds you’ve created too! I love love love your cards! I love the Ken Oliver colorbursts! The poinsettia done in the non traditional colors is my favorite! I very rarely use green and red for my Christmas cards! Great work! Love your cards, and loved the way you used the Color Burst, great job and TFS! I think I will have to try the Color Burst technique, I love those backgrounds! Thank you for all the inspiration. Your cards make me want to start on my holiday cards now! Very nice indeed. I really love that Christmas stamp set. I love your cards Laurel! I do like halloween cards! yours are fantastic. thanks for sharing and for the chance to win a stamp set. Love the cards. The Halloween cards are so much fun. I don’t think that they are to crazy. The Christmas ones are just gorgeous. Thanks for the inspiration. 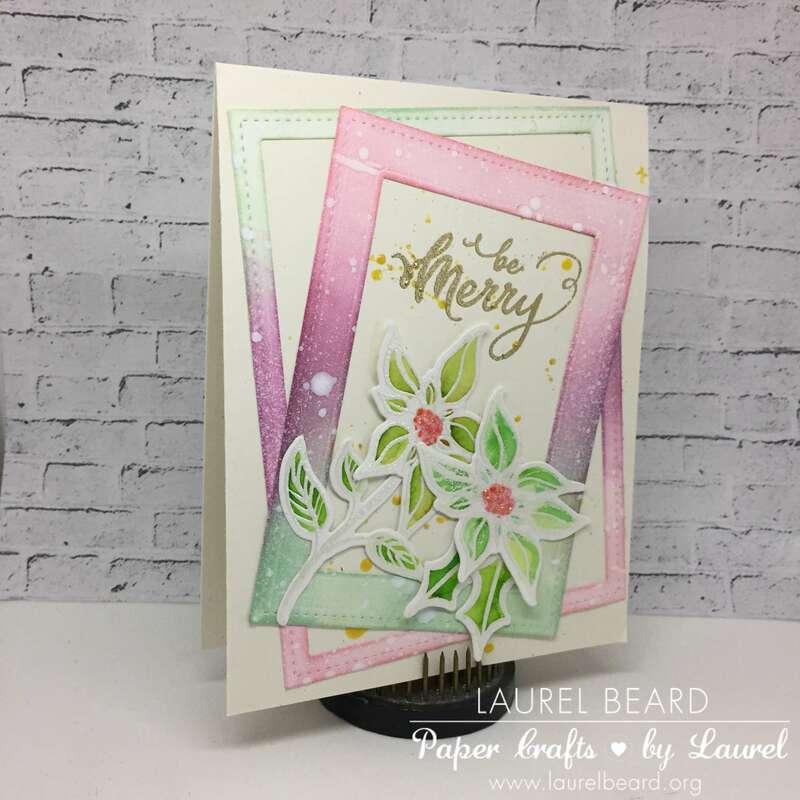 Laurel, I just love your pretty cards with the terrific backgrounds! Great ideas! Perfect technique for a Halloween card! I’m going to do that! Love the way you used these new stamps and dies! Your cards are great as always! terrific!!!! think the purple and orange colorbursts were MADE for Hallowe’en! that first card is BATTYRIFIC!!! I love all your cards. The Halloween backgrounds were fabulous! Fabulous Halloween backgrounds/cards. Beautiful Christmas cards! Very creative! I love your cards. I am excited for the holidays…. Although not prepared. I contemplated Christmas in July (which is progress) …. But I could not do it. This definitely gives me inspiration. Thank you! Ok, seriously.. Love ALL your cards.. Yes, even the one you laughed about. The ghosts are adorable, but I like the background, and the sentiment. It’s just fun. Looks like you had fun making it.. hehe Thanks so much for sharing, and taking the time to make videos. You put me in the mood for Halloween. Great cards, I love them. Thanks for sharing these great techniques. I love the background colors! Great cards and techniques. I love they way your white embossing on kraft turned out. Love your techniques, these are grat cards!! Love the cards! Such fun holiday stamps and dies! Love it all! The Halloween cards are Awesome! ? Great cards and video – thanks so much for sharing and for the chance to win!! I have my fingers crossed so hard – the Mistletoe and Holly set is my fave of the new release!! (Although I must say the background of your Halloween cards is to die for:-)) Just beautiful! I love how you coloring the background of all your cards, there are so beautiful and stunning! Great Halloween cards and I love the coloring on the craft Christmas card. Love your work and LOVE this stamp set. The best is the die cuts that match!!!! Thank for the opportunity! Beautiful cards, great backgrounds. Thanks for sharing. Super cute cards Laurel. I love the 3 ghost card. Thanks for sharing with us. I didn’t think I was going to like this card. I was thinking….she’s colouring the poinsettia flower green, she’s colouring the pinecone purple…..what on earth is she thinking. But when you were finished WOW….it was perfect. Love this release! Love what you did! Fun Halloween cards, my favorite holiday to make cards for. Love all stamp sets for all 3 holidays! Fun! Fun! Fun! My favorites are the mistletoe and holly plus the mondo poinsietta. Great cards, thanks for sharing! Fantastic! What an awesome release! Beautiful cards! I am just loving this new release! What a wonderful technique with the Halloween card. Thanks you for the tips of using a gel pen for missing lines with the embossing powder and also to flick the back of the card to make sure the poinsettia dots are rounded and not peaked. Beautiful card! Glad to see someone as obsessed with watercolor techniques as I am! Love all your cards! You really worked these stamp sets to the max. Love the backgrounds on the halloween cards. I love the Colorbursts on the Halloween cards. The video was great as was the coloring on the poinsettia cards.. Such incredible cards and love the backgrounds you created. I love the backgrounds that you did!! I love your cards! Cute Halloween cards and gorgeous Christmas cards! Fabulous background! Thanks for sharing. Cute cards. Love the cards and the new products. I’m a sucker for anything Christmas related especially poinsettias! Beautiful Cards. Love the Halloween ones. What a fun and special Christmas card! lovely cards! I love this stamp set! it is always such a pleasure to watch your videos and creativity! Great cards and great collection!! Love the Color Burst card; it looks so cute! Amazing cards. I like them all. Can’t wait to see the rest of the hop and then come back and catch up on all the cards you previewed. Gorgeous cards & an awesome video! Loved seeing the Color Burst powders used as I just got some & have not had a chance to play with them. The cards are so beautiful it’s hard to choose a favorite. But if I was pressed, I’d say the one you did using Mistletoe & Holly is my favorite. Thanks for sharing the beauty. Your cards are all wonderful! I think your “wild ” card is so cool! Such a spooky background for those cute ghosties!!! Great cards, Laurel! I especially love the fun background on the first one! The color burst background on the first card is so beautiful and I watched your video and enjoyed your designing process very much. This release is wonderful and I would be thrilled to win! Thank you, Laurel!!! Laurel I love your backgrounds & I agree those ghosts are super cute!!! the first card looks like there’s been an explosion. Love the bat flying out of it. The flowers are so pretty. Can’t wait for Christmas and time to make those cards. So ready for Halloween now, seeing your cards. Christmas will have to wait. TFS. Oh I love the ghosts card! Great background! All the cards are beautiful & love the effect you got with the color burst! The Christmas cards are great. Pick me! Pick me!! Super awesome. Love your beautiful ideas. Great colors on backgrounds with color burst. And the christmas cards look amazing. So fun! Thanks for the ideas! Hi! My name is Aubrey and I’m 11 years old. I haven’t really gotten into stamping yet, but after watching a lot of videos I really want to! I all your cards are amazing and I really hope that I will be able to, too someday! Thanks for the giveaway opportunity! Great techniques and i love this new release. Love the cards! Thanks for sharing so many examples. 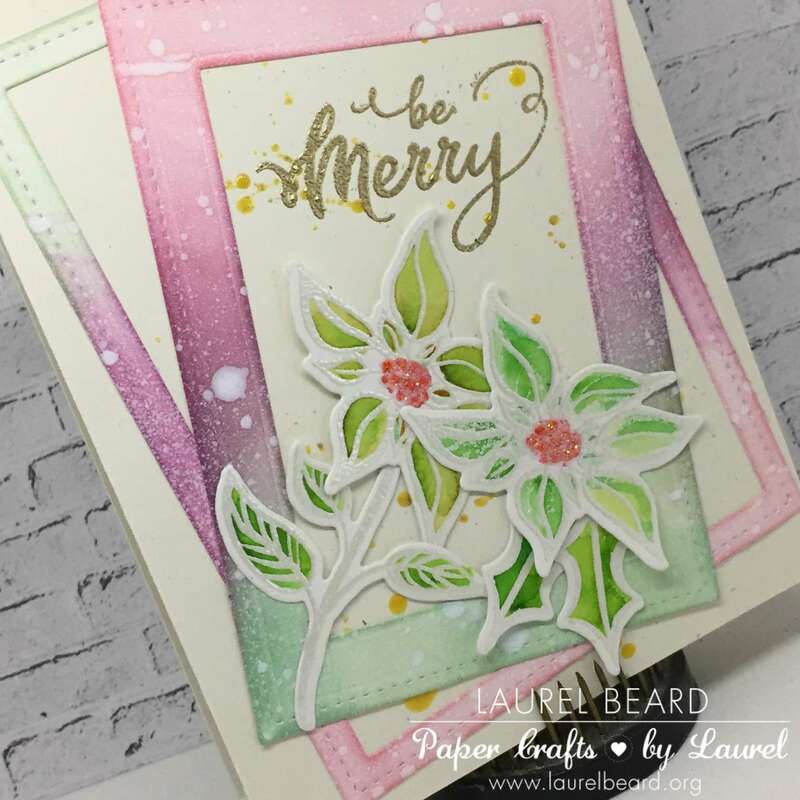 Wow, love the ghosts card with that background and the poinsettia is lovely! love the craft and christmas mix! Love your Be Merry card so much! Love the cards! I love to win and spend Labor Day weekend with my art! Love the holiday stamps – and love what you have done with them! I love your non-traditional cards – they are beautiful. Great release. LOVE your Halloween cards, especially the background on the first. I might take it as an inspiration for the invitations to my son’s first birthday party 😉 Thanks! WOW, I am really impressed with all your cards even though your second one isn’t my style either. Love the Mistletoe and Holly set, especially, and both of those cards are fabulous. Great job with video and all ~ crossing my fingers I’m a lucky winner! How creative! Looking forward to returning from work today to watch the videos! Fab set of cards! Love the creative backgrounds and techniques showcased, TFS! Loved the cards! Especially the beautiful backgrounds and how well you combine them with the fabulous stamps of this release! All of your cards are awesome but I particularly love what you did with the Halloween card and the bat! Thanks for the ideas using this new release. The pop of color of the stripes is a great idea. Love your Mistletoe and Holly cards. Great techniques to try. Thanks for sharing! Lovely cards! Thanks for sharing and for the chance to win. Really like your “Be Merry” card – thanks for doing videos! Oh my, those cards look amazing. Love those vibrant backgrounds and you showed that those pointsettias are even more versatile than I already thought. Great cards! More techniques for me to try! Awesome mixed media cards!! I need this entire release for sure. Thanks for the video too.